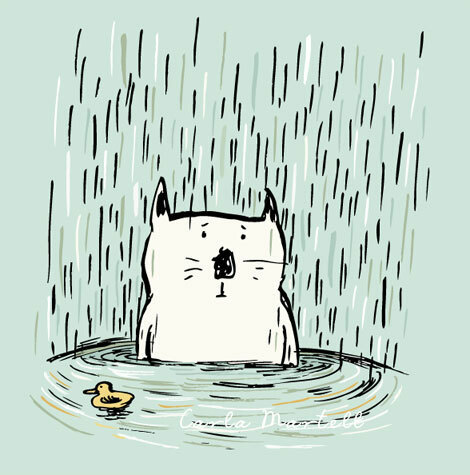 Illustration Friday theme this week: Soaked. Not a brand new drawing, but it seemed to fit! I've been feeling quite a lot like this over the past few weeks. Inundated and overwhelmed. Lots happening, lots of changes, both good and not so good, which has left me a bit like this cat - a bit gormless and staring vacantly into space. It fits perfectly. Great little illustration! I love this! Great expression and truly soaked. Perfect with the facial expression, that cat is so miserable and annoyed : ( do you have a drawing of when he is all dried out, like a happy ending ? : ) love your drawing and the color choice as well!